How to Unlock Samsung Android phone with Broken Screen and if Display not working? Recently my Samsung Galaxy S3 phone screen got Cracked. The phone is working fine but the Display is not Working ie. it's not displaying anything, I tried few method's by connecting the phone to my PC to backup the data but all my tries didn't work. With a bit of Luck and with some online knowledge i had successfully backed-up my data to my PC, Below is the process which i used to backup data from my Screen cracked Samsung phone. Note:: The phone should have access to internet and you should have a Samsung account linked with the phone. (That's it for the "Luck" Part). Launch your Browser and goto " https://findmymobile.samsung.com " . Now, sign in to the site with the help of your Samsung Account Credentials that you used to register your device. 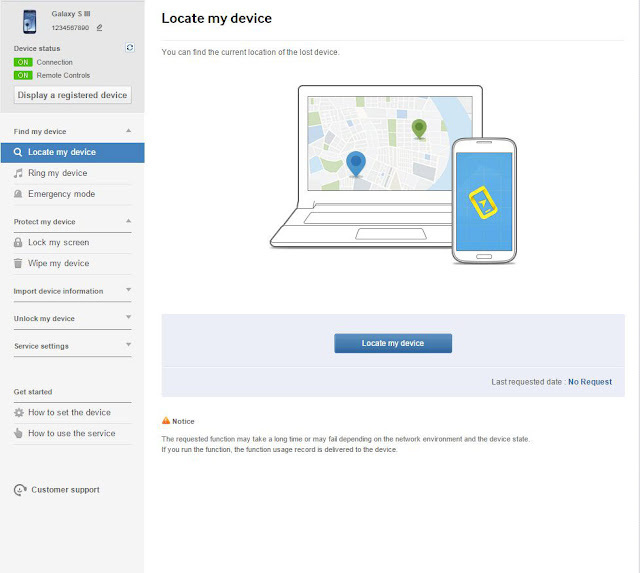 You will be provided with the List of Devices that are connected/linked with the Account as follow's. Select the Respective device which you want to unlock. Note:: On the top left of the screen you will have the Registered device icon, under which you should have the Device status showing "Connection" and "Remote controls" as "ON". To the left side of the site, you can see an option as " Unlock my Device" select it. Now,Click on the "Unlock" button, it may take sometime for your Device to get unlocked. If all goes well, you should be able to hear screen unlock sound ( which i heard when my phone got unlocked :-0 ) and you will see the above message as "The function has been executed successfully". Now connect your Device to the PC and backup all the data. Note:: You can also use this method to unlock your Samsung device after too many pattern attempts. It’s a horrible feeling when your phone is locked behind a passcode you just can’t remember. Luckily, this Dr.Fone for Android can help you remove the pattern, fingerprints, PIN and password without data loss.